Andrew Stephen Roddick ( Andy Roddick ) is a former world number one singles professional American tennis player. He has won one Grand Slam singles championship which is the 2003 US Open. Andy Roddick has come to the finals in four other singles Grand Slam championships (3 Wimbledon and 1 US Open) losing to Roger Federer on each occasion. Roddick is known for his super fast serve. He holds the record for the fastest serve in professional tennis at 155mph which was served in a 2004 Davis Cup match on hard court. Andy Roddick’s nick name is “A-Rod”. Roddick is known for his humanitarian work. He established the Andy Roddick Foundation to help at risk kids. Andy has been awarded the Humanitarian Leadership Award by the Arthur Ashe Institute of Urban Health. Andy Roddick was born on August 30, 1982, in Omaha, Bebraska to Jerry and Blanche Roddick. Roddick’s father was an investor and his mother was a school teacher. Roddick has two older brothers named Lawrence and John. John was an All-American tennis player at the University of Georgia and now operates a tennis academy at San Antonio. Lawrence is a chiropractor and a former member of the US Senior National Spring Board Diving Team. Andy began dating singer Mandy Moore in 2002. He ended the relationship in March 2004. Roddick started to date Brooklyn Decker from 2007. Brooklyn Decker is a fashion model that Roddick spotted while reading the Sports Illustrated Swimsuit Issue. Roddick got married to Decker on April 17, 2009. In 2000 Roddick won the Junior US Open and Australian Open singles titles. He finished the year as the number one junior player in the world. Roddick’s breakthrough year was 2003. He won the Queen’s Club tournament which is a warm up tournament for Wimbledon and came to the Wimbledon semi finals loosing to the eventual champion Roger Federer. Roddick won his first Masters Series tiles in 2003 which were in Canada and Cincinati. He won the US Open. By the end of the year at age 21 Roddick was ranked number one singles player in the world. 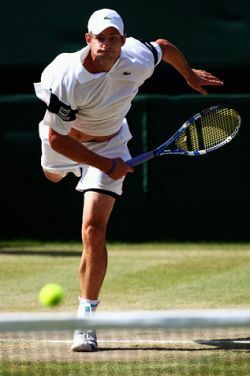 In 2004 Roddick came to his first Wimbledon finals. He lost in four sets to Roger Federer. Roddick finished the year as the number two player in the world and the player with the most aces with 1,017. 2005 was not a great year for Roddick. He came to the Wimbledon finals once again and lost again to Federer. After the 2006 Wimbledon Tournament Roddick hired the tennis legend Jimmy Connors to be his coach. There was a bounce in Roddick’s performance. Roddick won his first masters event since 2004 at Cincinnati. He came to the finals of the US Open losing to Federer. Roddick finished 2007 by helping the US Davis Cup team beat Russia in the finals. In 2008 Roddick split with Jimmy Connors who was his coach for two years. On the 1st of December, 2008, Roddick hired Larry Stefanki as his new coach. Stefanki had previously trained some of the best men’s players such as John McEnroe, Marcelo Rios, Yevgeny Kafelnikov, Fernando Gonzalez, and Tim Henman. Roddick decided not to defend his Dubai title in 2009 with prize money over $2 million to protest against the refusal of the United Arab Emirates to grant Israeli Shahar Peer a visa for the Women’s event. He had a spectacular run at Wimbledon loosing in the finals to Roger Federer 14-16 in the fifth and final set. Andy uses a discontinued version of the Babolat Pure Drive, extended to 27.5 inches. Lead tape is added to the head to make the racket more head heavy. His rackets are painted to resemble the Pure Drive Roddick Plus with Cortex to market this current model sold by Babolat. For marketing purposes Roddick endorses the Pure Drive Roddick GT Plus Cortex Racket. Andy strings with a hybrid Pro Hurricane Tour + VS. Both Babolat strings. His tension is roughly 64 or 65 pounds but varies. Roddick uses the Babolat Propulse II tennis shoes which are his signature product. His tennis clothing is from Lacoste. Andy Roddick is an aggressive baseline player. He has a double handed topspin back hand and a single handed slice backhand. Roddick’s biggest weapon is his powerful topspin serve. He usually servers around 130-150 mph. Andy Roddick has worked on becoming more of an all court player. Under new coach Larry Stefanki his volleying skills have improved. He is also in the fittest shape of his career. Fastest server in professional tennis at 155 mph during Davis Cup match on hard courts in 2004. 2004 ESPY Award for Best Male Tennis Player. Fastest server at a Grand Slam tournament at the 2004 US Open at 152 mph. Awarded the Arthur Ashe Humanitarian Award of the year in 2005. Roddick and the Andy Roddick Foundation were awarded the 2007 Humanitarian Leadership Award by the Arthur Ashe Institute of Urban Health. Most games won at a Grand Slam final at 39 at the 2009 Wimbledon finals.